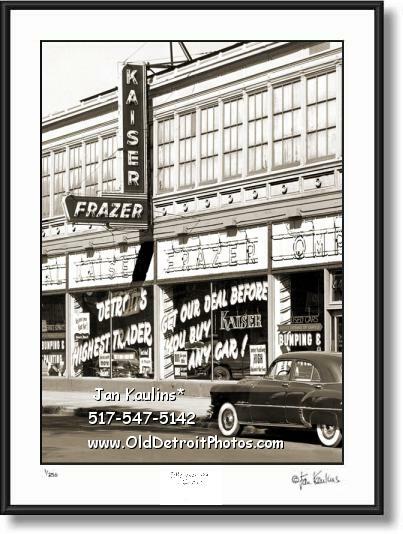 KAISER FRAZER DETROIT DEALERSHIP 1952 photo print picture for sale. This sepia toned KAISER FRAZER Detroit dealership photo print is made from a historic vintage restored Original 1952 black and white Kaiser Frazer Detroit dealership photograph print. This dealership was in downtown Detroit on the same block as the Detroit Convention Hall. This is a rare photo of this Kaiser-Frazer Dealership in Detroit. The Kaiser-Frazer Corporation was a result of a partnership between auto executive Joseph W. Frazer and Industrialsist Henry J. Kaiser. The company combined the diminishing assets of the former Graham-Paige Motor Company. Displaying their prototype of their two newest cars at the Waldorf Astopria Hotel in New York City, the Kaiser was of an advanced front wheel design while the Frazer was an upscale conventional rear wheel drive vehicle. The company was short lived, though with an interesting history of unique styling and engineering advances, and produced its last venicles as Kaiser Motors Corporation until 1955. There were not many dealerships as production was no where near that of the big three---making this a quite unique and special Kaiser Frazer Detroit Dealership photo print. THESE BLACK AND WHITE DETROIT PHOTO ART PRINTS ARE VERY HIGH QUALITY REPRODUCTIONS OF ORIGINAL OLD VINTAGE HISTORICAL DETROIT PHOTOGRAPHIC PRINTS. THESE SEPIA TONED DETROIT PHOTOS ARE OFFERED FOR SALE HERE FOR THE VERY FIRST TIME. THEY HAVE BEEN MADE FROM ORIGINAL NEGATIVES OR ORIGINAL FIRST GENERATION PRINTS, MANY OF THEM ARE 50 YEARS OLD AND SOME DATE TO THE EARLY 1920's AND 1930's. THE RARE OLD DETROIT ORIGINAL PHOTOS AND BLACK AND WHITE NEGATIVES USED FOR THESE PRINTS HAVE BEEN OBTAINED FROM HISTORICAL SOCIETIES, NATIONAL ARCHIVES, THE LIBRARY OF CONGRESS AND NUMEROUS PRIVATE COLLECTIONS. IT HAS TAKEN SEVERAL YEARS TO PUT THESE OFFERINGS TOGETHER ON THIS WEBSITE. MANY OF THESE PHOTOS ORIGINALLY CAME FROM OLD DEFUNCT NEWSPAPER AND MAGAZINE ARCHIVES, WHERE THEY WERE USED ONCE FOR A STORY AND THEN USUALLY JUST THIS ONE ORIGINAL PRINT WAS MADE AND KEPT FOR THEIR ARCHIVES. HENCE, THESE HISTORICAL IMAGES WERE NOT ORIGINALLY MADE TO BE FOR SALE, BUT WERE TO BE USED AS IMAGES FOR NEWS STORIES AS THEY UNFOLDED--MAKING THESE IMAGES EXTREMELY RARE HAVING SURVIVED SO MANY YEARS. VERY FEW OF THESE IMAGES HAVE EVER BEEN OFFERED FOR SALE TO THE PUBLIC UNTIL NOW. THE ORIGINAL OLD DETROIT BLACK AND WHITE PHOTOGRAPHS HAVE DIGITALLY BEEN RE-MASTERED AND ALL MAJOR FLAWS, SUCH AS TEARS, SRACTCHES, MISSING PIECES, FOLDS, INK STAINS ETC. ON THESE RARE PHOTOS HAVE BEEN PAINSTAKINGLY REMOVED AND CORRECTED AND HIGH QUALITY PRINTS OF THESE HISTORIC RARE DETROIT BLACK AND WHITE SEPIA TONED PHOTOS ARE NOW OFFERED, FOR THE FIRST TIME, ON THIS WEBSITE WWW.OldDetroitPhotos.COM . THESE PHOTOS HAVE BEEN BEAUTIFUL RESTORED AND ARTISTICALLY SEPIA TONED AND OFFERED IN A LIMITED EDITION OF INDIVIDUALLY PRINTED PHOTO PRINTS. THEY ARE READY FOR DISPLAY IN YOUR HOME OR OFFICE. HERE IS YOUR CHANCE TO PURCHASE AND ENJOY SOME VERY SPECIAL AND UNIQUE DETROIT PHOTOGRAPHIC HISTORY.